Discovering new apps is always one of the most important and difficult things in the new smartphone ecosystem, especially as the number of total apps keeps growing and growing. The Windows Phone Marketplace is running towards 20,000 total apps, so discovery is becoming more and more important in finding quality apps that will fit into your daily usage. The full featured web store for the Marketplace is planned to launch in time for the the WP 7.1 Mango update expected early this summer. 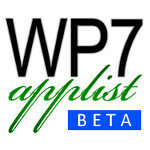 But, until then one of the best options is WP7applist, which has just released an app into the Marketplace. WP7applist is a great tool for search and discovery in the WP Marketplace, but their website has never worked quite right in the mobile browser on Windows Phone 7 devices. Now, there is a fancy new app to help you discover new apps. The app has a Spotlight page filled with featured apps, but the real value comes from the Discovery page which allows users to sort apps into new releases, recently updated, recent price drops and apps that have become free. Each app link gives information, screenshots and reviews of apps as well as an easy link to the official Marketplace to download or purchase apps. The app even includes a Live Tile which will allow you to keep track of the total number of apps in the Marketplace as well as the number of newly released apps and app updates over the past 24 hours. As of right now, WP7applist is an invaluable tool for WP7 users, but it's unclear how the site will fare once the full featured web Marketplace launches. There is a good chance that the future may hold the same fate as AppBrain, which is a similar service for Android that has lost a lot of its appeal since the Android Market web store had its massive overhaul in February.